DOES ANYONE KNOW ANOTHER "KOLTON"???? I HAVE A FEW ITEMS KOLTON HAS GROWN OUT OF THAT HAVE HIS NAME ON THEM AND SINCE MY NEXT KID WILL NOT BE NAMED KOLTON I AM SELLING THESE ITEMS. (BAG, TOWEL, SHIRTS, LOVEY, EXT.) SINCE I LOVE PERSONALIZED THINGS...KOLTON HAS ACCUMULATED ALOT!). THE DIAPER BAG WAS MY FAVORITE! I HONESTLY CRINGE TO THINK IT NEEDS TO GO...I BOUGHT IT FROM A FRIEND THAT GOT IT FROM A BOUTIQUE IN KNOXVILLE THEN I MONOGRAMMED IT. NOW I HAVE UPDATED TO A MORE "TODDLER-ISH" DIAPER BAG. ANYWAYS I THOUGHT MAYBE SOMEONE KNEW SOMEONE THAT MAY KNOW ANOTHER BABY KOLTON. IF SO, AND YOUR INTERESTED, LET KNOW...VIA EMAIL. 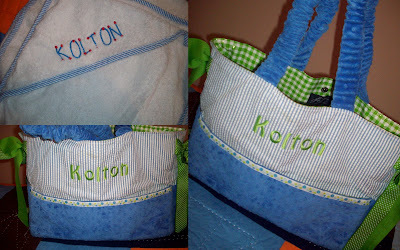 Maybe you could come up with a creative way to monogram your next child's name over Kolton's name. Like put a pretty solid colored patch that is already monogrammed on top of Kolton. What do you think? It would be a nice, frugal way to reuse something you love. Sewn the right way, no one will ever know!